Climate change is real and rapid and will impact directly on many of our coastlines, the University of Ulster’s internationally renowned coastal scientist Professor Derek Jackson has warned. Professor Jackson, who is a member of the Ulster’s Environmental Science Research Institute in Coleraine, said coastlines are a valuable environmental resource but meaningful action is needed if they are to be managed properly. During his inaugural Professorial Lecture at the University’s Coleraine campus, Professor Jackson explained how Ulster’s coastal science research had led to an improved understanding of the potential danger to the Earth’s coastlines from climate change. He also highlighted how Coleraine based researchers had teamed up with US planetary scientists on research into dunes on Mars:“Modern coastal science has advanced much in recent years due to the advent of state-of-the-art monitoring and computer modelling, revealing a great deal about how coastlines function as a complex environmental system,” he said. “Management of the beach and dune zone, however, still lacks proper science-led approaches. "The beach-dune interface zone where air, land and sea come together, is one of the planet’s most physically diverse zones, creating multiple ways in which a coastline evolves over time and space.However, nearly every country in the world that possesses a coastline has artificially altered it in some way to accommodate human activities or habitation. Professor Jackson, who is a Fellow of the Royal Geographical Society as well as the Geological Society of London, holds a number of externally-funded UK Research Council grants that have examined beach and sand dune systems all around the world. His research portfolio has led him to investigate coastal sites from Magilligan to the Caribbean and the Great Barrier Reef in Australia, enabling a complete range of coastal types and behaviours to be examined. Currently a member of the UK Natural Environment Research Council peer review system and previously appointed as an evaluator for the Intergovernmental Panel on Climate Change, Professor Jackson has seen much of the science that proves climate change is rapid and real and that it will impact on many of our coastlines. Professor Jackson argued: “The extent of the impact will vary according the coastline’s position above present sea level and its latitude. "One thing that is pretty obvious from my research travels is that a coastline is a precious and fascinating natural resource that more often than not is inadequately protected and managed. Professor Jackson also highlighted recent exciting developments that have led him to work on some of the dunes on the planet Mars. “Computer airflow modelling used frequently in engineering has never really been applied effectively in natural environments at the correct scale. We have recently used this technique over Irish beach and dune systems and currently lead the world in this type of application. Among those present at the lecture was leading coastal scientist Professor Gonzalo Malvarez from the University of Pablo de Olavide, Spain, who has worked closely with Professor Jackson since the early 1990’s on many collaborative research projects. Professor Derek Jackson (centre) with Professor Gonzalo Malvarez from the University of Pablo de Olavide, Spain, who has worked closely with Professor Jackson since the early 1990’s on many collaborative research projects and Professor Richard Barnett. 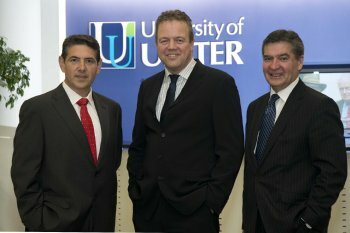 Vice Chancellor, University of Ulster.